After almost two years since the July 2012 elections, the Libyan crisis has not shown any signs of de-escalation: the country continues to face political turmoil, tribal cleavages, street violence, and pervasive civil disorder. In the last two years, radicalized groups and militias, mostly from the eastern regions, have been responsible for the countless killing of civilians, public officials, and foreign dignitaries, and have generally contributed to the state of anarchy and widespread violence in the country. Coupled by weak governmental structures and the failed attempts by consecutive transitional governments to pacify the country, Libya finds itself on the brink of civil chaos. What is obvious is that Libya’s democratic aspirations, fiercely fought for during the Arab Spring revolution, have all but collapsed. Libya’s regional divisions date back to the early years of the 1950s, as a federation of three separate regions, the Republic of Tripolitania, the Emirate of Cyrenaica, and Fezzan, which mark the main tribal cleavage lines still dividing the country to this day. After 40 years of Qaddafism, the acute legitimacy void and the government’s incompetence are especially problematic in a society without a solid tradition of political debate, strong party opposition, and a healthy civil society. The lack of leadership was made evident by the successive failed attempts to broker political negotiations, to instill civil trust, and to build consensus in a highly polarized society. A proficient caretaker and broker government is needed to skillfully negotiate the ceasefire and to avoid the expression of political and religious views through the use of weapons and violence. However, in the post-Qaddafi era, the prospects of Libya’s peaceful transition to democracy, social and economic stability, and the rule of law remain glum. The prevailing security situation in Libya is in question due to a series of structural factors: state weaknesses, increased regional and political polarity, a generalized economic crisis, the proliferation of Islamist armed militias and tribal fiefdoms, and large-scale military confrontations. The country suffers from economic stagnation and it has no viable constitution or a national army to ensure both short-term and long-term order. Libya is confronted with the most intense fighting since the revolt that ousted the dictator Muammar al-Qaddafi three year ago, displayed by the central government’s incapacity to assert control over the country. The recent crisis has been a window of opportunity for the controversial retired general Khalifa Haftar (a once anti-Qaddafi activist who chose exile in the United States) to rally under his leadership scores of anti-Islamist militias for the purpose of a so-called “war on terrorism” redolent of the George W. Bush era. The recent escalation of events paints a grim future for Libya’s democratic transition and heralds more bloodshed and a possible decisive confrontation between pro-Islamic militias and the ones loyal to Haftar. In a country already struggling to impose civil order, the failed attempts by the governmental leadership to bring rebel militias under control have had devastating effects. Countless violent incidents were reported of rebel fighters’ activities: in October 2013, they temporarily kidnapped the now exiled, former Prime Minister, Ali Zeidan; they seized important oil terminals and landmarks, including the parliament building in March 2014; and they were responsible with killing numerous civilians, political leaders and foreign dignitaries. Consequently, it is not surprising that there still persists a lingering sense of nostalgia for the order and stability provided under the Qaddafi rule. By refusing to disarm and to submit to the government’s central authority, the radicalized Islamic groups that were formerly suppressed under Qaddafism have recently emerged as one of the most corrosive threats and insecurity liabilities for Libya. Their disruptive activity was highlighted by the September 2012 attack on the US facilities in Benghazi, resulting in the death of Ambassador Christopher Stevens and three US officials. As well, radical Islamist groups are now in possession of sophisticated weaponry that went missing from Qaddafi’s arsenal during the Arab Spring revolution, which offer further grounds for worry and account for the increasing number of casualties. Opposing military units and militias tied to the cities of Benghazi, Tobruk, Ajdabiya, and Zintan pledged their alliance to Haftar’s “Libyan National Army”, and on May 16 initiated a series of offensives against pro-Islamist rebel groups in Benghazi. These nationalist militias, acting under the “Operation Karama” (dignity) and the leadership of the controversial military figure of Khalifa Haftar, an allegedly US-backed rebel commander, further added to the conflict escalation with the forceful seizure of Libya’s parliament in Tripoli on May 18. After its launch on May 16, the offensive code-named “Operation Dignity” and spearheaded by Libyan military officials to combat terrorist and extremist groups has had the reverse effect of further escalating the conflict. Haftar accused pro-Islamist members of parliament of incompetency and corruption, making them accountable for Libya’s transformation in a hotbed for terrorism and into a theater of civil violence. With members of parliament in complete disarray and split between Islamist and non-Islamist factions, the country fell once again under a veil of political uncertainty over the election of the next prime minister. The attack on the parliament came after three days of confrontations including tank and aircraft fire between Haftar supporters and pro-Islamist forces in the eastern capital of Libya, Benghazi. As the most concentrated clash witnessed since the Arab Spring in 2011, the fighting reached critical levels and rapidly spread across the country. The events further polarized militias and prompted mass demonstrations and public outcries condemning the incompetent authorities and the inability of security services to preserve order. The status-quo painted a bleak and confusing picture, with Libya’s interim parliament approving a new government under Prime Minister Ahmed Maiteeq. Maiteeq was meant to replace Abdullah al-Thanay, who fled to the eastern province of Cyrenaica with his cabinet and supporting parliamentarians, and who still claims to be the rightful prime minister of Libya. The vote cast by the Islamist-dominated General National Congress (GNC) for the contested Prime Minister Maiteeq further threatened to deepen Libya’s security and political crisis and antagonized the nationalist militias allied to the renegade general Haftar. Haftar has called out the GNC as illegitimate and militated for its overthrow, thus widening the polarization gap between anti-Islamist and Islamist groups. In the process, he also managed to build his public profile and to opportunistically capitalize on the rising public discontentment in Libya. In times of turmoil, a conciliatory type of political figure seems not be a successful leader, Haftar taking upon himself the role of a non-negotiating aggressive figure, who resort to force to attain his political goals – in his words “We see that confrontation is the solution / I do not think talks will work with them”. This rhetoric is problematic from several points of view: from justifying the use of force in the pursuit of power; negating any opportunities between the conflicting parties to reach a negotiated settlement; to demonizing one side through claims of protecting civilians. The political landscape was driven apart by the two rival governments fighting over legitimacy and central authority. On June 9, the Supreme Court deemed Maiteeq’s appointment as illegitimate, the previous interim Prime Minister Abdullah al-Thanay being set to remain in power until the elections on June 25. In a feeble effort to defuse the situation, Libya’s High Election Commission fixed the date for new parliamentary elections for June 25. Nevertheless, the conflict is ongoing with no effective national army or functional police force to protect the civilian population. As well, Haftar continues to claim that he is not interested in gaining political power nor has he received foreign support, his sole aim being that to guarantee “security for all our citizens”. 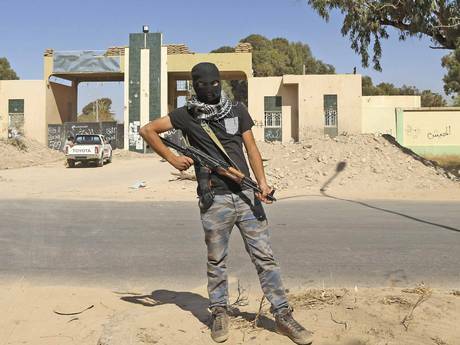 Unorganized security services, heavily armed groups, accessible weapons for rebel fighters, the possible alliance of radicalized Islamic militants with the Muslim Brotherhood, all have become underpinning concerns for Libya’s democratic future. The lack of security and the rampant conflict in the country have been the main hindrances in the democratic transition process, hampering economic growth and undermining the legitimacy of the central authority. To address such vulnerabilities, the Libyan leadership must target security sector reforms (SSR), facilitate dialogue and trust-building between the conflicting parties, involve the international community in constructive post-conflict reconstruction, and increase the consultative role of the NATO in the security reform process. While currently running a €30 million program in Libya, the EU should increase its capacity-building support and assistance in key areas such as civil society, elections, reconciliation programs, and public administration proficiency. Haftar’s future actions, as the self-proclaimed leader of the “Libyan National Army”, could have opposing consequences for Libya: by either setting the country on a course to become a failed state, by engaging the country in a long-term civil war between nationalists and pro-Islamist, or by actually laying the grounds for a functional and effective national army in charge with the unification of the country. The worst case scenario could spell the transformation of Libya into yet another military dictatorship. In the volatile post-Arab Spring regional security context, the risks that a non-democratic regime or military dictatorship would reappear and act unpredictably are very high. This entry was posted on 18/06/2014 by ISIS Europe in Contributors, Policy Briefs, Raluca Csernatoni and tagged Arab Spring, Benghazi, crisis, Gaddafi, General Haftar, Libya, Libyan National Army, Militias, Rebel Fighter, transition, Tribal Cleavages, Tripoli.